Material Components (MDC) help developers implement Material Design. Created by a team of engineers and UX designers at Google, MDC features dozens of beautiful and functional UI components and is available for Android, iOS, web and Flutter. What are Material Design and Material Components for Android? Material Design is a system for building bold and beautiful digital products. By uniting style, branding, interaction, and motion under a consistent set of principles and components, product teams can realize their greatest design potential. For Android applications, Material Components for Android (MDC Android) unites design and engineering with a library of components for creating consistency across your application. As the Material Design system evolves, these components are updated to ensure consistent pixel-perfect implementation and adherence to Google's front-end development standards. MDC is also available for web, iOS, and Flutter. In this codelab, you'll build a login page using several of MDC Android's components. This codelab is the first of 4 codelabs that will guide you through building an app called Shrine, an e-commerce Android app that sells clothing and home goods. 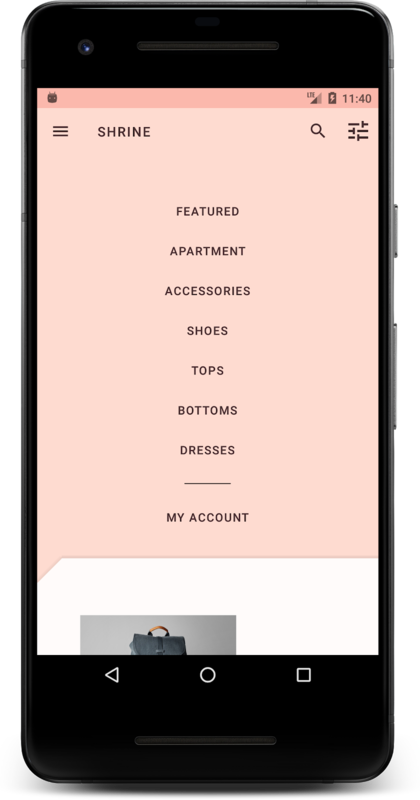 It will demonstrate how you can customize components to reflect any brand or style using MDC-Android. Two buttons, one for "Cancel" and one for "Next"
In this codelab you'll use the default components provided by MDC Android. You'll learn to customize them in MDC 103: Material Design Theming with Color, Shape, Elevation and Type. How would you rate your level of experience building Android apps? When you open Android Studio, it should display a window titled "Welcome to Android Studio". However, if this is your first time launching Android Studio, go through the Android Studio Setup Wizard steps with the default values. This step can take several minutes to download and install the necessary files, so feel free to leave this running in the background while doing the next section. The starter app is located within the material-components-android-codelabs-101-starter/java directory. Once the setup wizard finishes and the Welcome to Android Studio window is shown, click Open an existing Android Studio project. Navigate to the directory where you had installed the sample code, and select java -> shrine (or search your computer for shrine) to open the Shrine project. Wait a moment for Android Studio to build and sync the project, as shown by activity indicators along the bottom of the Android Studio window. At this point, Android Studio might raise some build errors because you are missing the Android SDK or build tools, such as the one shown below. Follow the instructions in Android Studio to install/update these and sync your project. The project needs a dependency on the MDC Android support library. The sample code you downloaded should already have this dependency listed, but it is good practice to do the following steps to make sure. (Optional) If necessary, edit the build.gradle file to add that dependency and sync the project. Ensure that the build configuration to the left of the Run / Play button is app. Press the green Run / Play button to build and run the app. In the Select Deployment Target window, if you already have an Android device listed in your available devices, skip to Step 8. Otherwise, click Create New Virtual Device. In the Select Hardware screen, select a phone device, such as Pixel 2, and then click Next. In the System Image screen, select a recent Android version, preferably the highest API level. If it is not installed, click the Download link that is shown and complete the download. On the Android Virtual Device (AVD) screen, leave the settings as they are and click Finish. Select an Android device from the deployment target dialog. Android Studio builds the app, deploys it, and automatically opens it on the target device. If you were unable to add the dependency or run the app successfully, stop and troubleshoot your developer environment. If you get an INSTALL_FAILED_INVALID_APK error when building, try doing a ‘Build' -> ‘Clean Project' in Android Studio. Success! 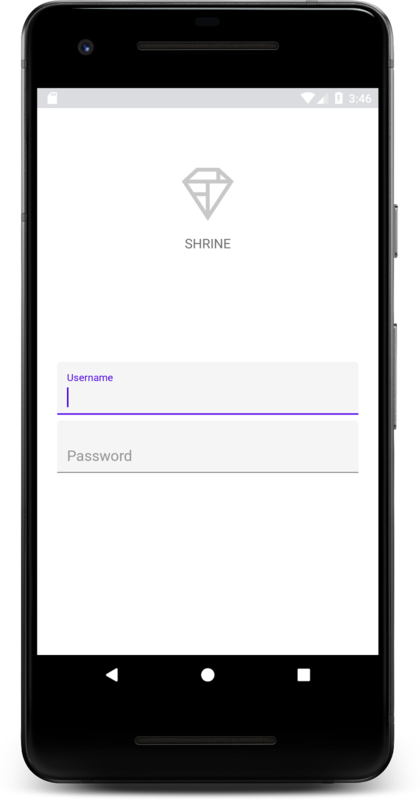 The starter code for Shrine's login page should be running in your emulator. You should see the name "Shrine" and the Shrine logo just below it. Let's take a look at the code. We've provided a simple Fragment navigation framework in our sample code to display fragments and navigate between fragments. * Navigate to the given fragment. * @param fragment       Fragment to navigate to. * @param addToBackstack Whether or not the current fragment should be added to the backstack. This activity displays the R.layout.shr_main_activity layout file, defined in shr_main_activity.xml. You can see that in onCreate(), MainActivity.java starts a Fragment transaction in order to show the LoginFragment. LoginFragment. That is what we will be modifying for this codelab. The activity also implements a navigateTo(Fragment) method, defined in NavigationHost, which lets any fragment navigate to a different fragment. Command + Click (or Control + Click) shr_main_activity in the activity file to open up the layout file, or navigate to the layout file in app -> res -> layout -> shr_main_activity.xml. Note: If you see an application preview rather than an XML file when you open shr_main_activity.xml, switch from the "Design" tab to the "Text" tab in the bottom left of the panel. We will be working in the "Text" tab for the duration of this codelab. Here, we see a simple <FrameLayout> which acts as a container for any fragments the activity displays. Let's open up LoginFragment.java. * Fragment representing the login screen for Shrine. // Snippet from "Navigate to the next Fragment" section goes here. LoginFragment inflates the shr_login_fragment layout file and displays it in onCreateView(). Let's take a look at the shr_login_fragment.xml layout file to see what the login page looks like. 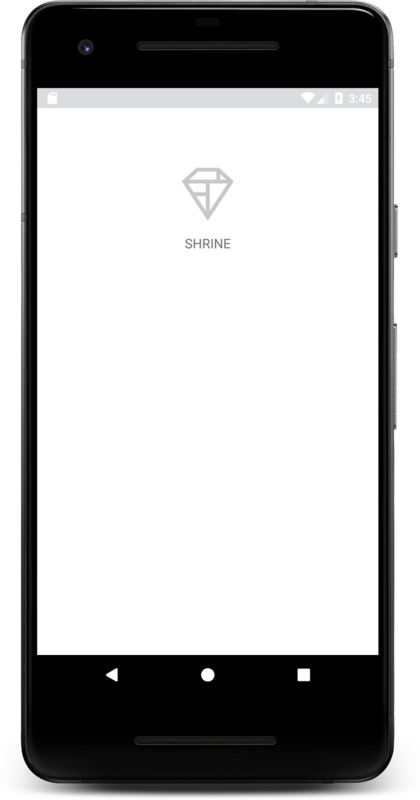 Here, we can see a <LinearLayout> with an <ImageView> at the top, representing the "Shrine" logo. Following that, there is a <TextView> tag representing the "SHRINE" label. The text for this label is a string resource named @string/shr_app_name. If you Command + Click (or Control + Click) the string resource name, or open app -> res -> values -> strings.xml, you can see the strings.xml file where string resources are defined. When more string resources are added in the future, they will be defined here. Every resource in this file should have a shr_ prefix to denote that they are part of the Shrine app. Now that you're familiar with the starter code, let's implement our first component. To begin, we'll add two text fields to our login page for people to enter their username and password. We'll use the MDC Text Field component, which includes built-in functionality that displays a floating label and error messages. 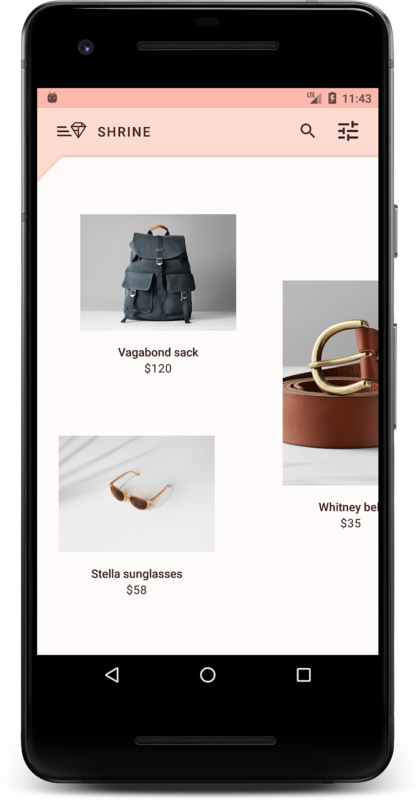 Material Design text fields have been greatly enhanced to provide more customization options to support your brand, with improvements backed by extensive user experience (UX) research for better usability and visual design. Learn more about the new text fields in their article of the Material Guidelines. Tip: To quickly open a file in Android Studio, double-tap the Shift key to bring up a floating search bar, and type the name of the file you want to open. The above snippet represents two text fields, each consisting of a <TextInputLayout> element and a <TextInputEditText> child. The hint text for each text field is specified in the android:hint attribute. We've included two new string resources for the text field -- @string/shr_hint_username and @string/shr_hint_password. Open strings.xml to see these string resources. TextInputLayout components provide built-in error feedback functionality. Set the app:errorEnabled attribute to true on the Password TextInputLayout element. This will add extra padding for the error message underneath the text field. Set the android:inputType attribute to "textPassword" on the Password TextInputEditText element. This will hide the input text in the password field. Now try running the app. You should see a page with two text fields for "Username" and "Password"! Next, we'll add two buttons to our login page: "Cancel" and "Next." We'll use the MDC Button component, which comes with the iconic Material Design ink ripple effect built-in. In shr_login_fragment.xml, add a <RelativeLayout> to the <LinearLayout>, underneath the TextInputLayout elements. Then add two <MaterialButton> elements to the <RelativeLayout>. Note: The MaterialButton component has a default style of a colored, elevated button. For this Cancel button, however, we want an unelevated, unfilled button. To accomplish this, we apply a style attribute: @style/Widget.MaterialComponents.Button.TextButton. That's it! When you run the app, an ink ripple will display when you tap each button. Finally, we'll add some Java code to LoginFragment.java to hook up our "NEXT" button to another fragment. You'll notice that each of the components we added to our layout had an id assigned to it. We will use these ids to reference the components in our code and add some error checking and navigation. authentication of the username and password. Next, add a click listener to the "Next" button that sets and clears the error based on the isPasswordValid() method we just created. In onCreateView(), this click listener should be placed between the inflater line and the return view line. Next, let's add a key listener to the password TextInputEditText to listen for key events that would clear the error. This listener should also use isPasswordValid() to check whether or not the password is valid. You can add this directly underneath the click listener in onCreateView(). // Set an error if the password is less than 8 characters. // Clear the error once more than 8 characters are typed. Note: If Android Studio encounters Cannot resolve symbol errors when writing this code, press Alt + Enter or (Option + Return on Mac) to import the missing symbols. This new line of code calls the navigateTo() method from MainActivity to navigate to a new fragment -- ProductGridFragment. Currently this is an empty page which you'll work on in MDC-102. The false parameter in navigateTo() tells the activity to not add the current fragment to the backstack, so the user will not be able to return to the login screen using their back key. Now, build the app. Go ahead and press the Next button. You did it! This screen will be the starting point of our next codelab that you'll work on in MDC-102. Using basic XML markup and ~30 lines of Java, the Material Components for Android library has helped you create a beautiful login page that conforms to the Material Design guidelines, and also looks and behaves consistently across all devices. The completed MDC 101 app is available by downloading the finished codelab, or by checking out 101-complete with git: git checkout 101-complete. 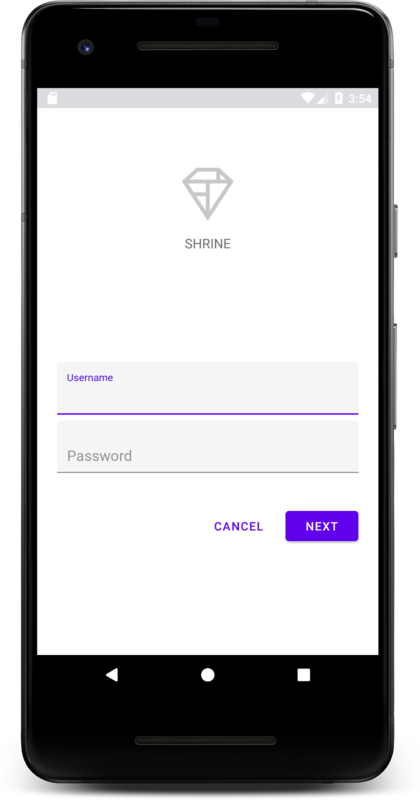 You can test your version of the page against the completed version by opening the Shrine project in that directory with Android Studio and running the app. The Text Field and Button are two core components in the MDC Android library, but there are many more! You can explore the rest of the components in MDC Android. Alternatively, head over to MDC 102: Material Design Structure and Layout to learn about the top app bar, card view, and grid layout. Thanks for trying Material Components. We hope you enjoyed this codelab!